Look at what I made! 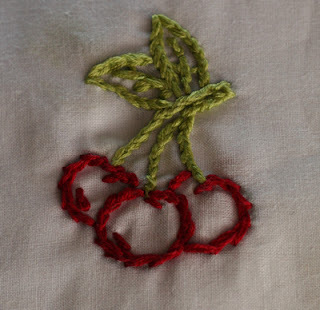 I have been wanting to learn to embroider for a long time and now I am teaching myself! I was given an embroider kit while I was in the hospital from Jonathan's co-workers and I just pulled it out yesterday. Thank you again EWU for all of the goodies! 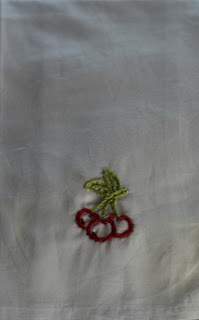 This is my first attempt at anything - it is a tea towel that I am handing off to Holland for her play kitchen area. It's a little messy, but I think I will get better as I practice. I will get better, right? My next project will be something babyish - maybe a onesie, a t-shirt, a pillow case, or something to frame for the wall. Gosh! There are so many choices! Stay tuned for postings of future projects! Congratulations on your first project! I knew you were a chip off the old block!! It thrills me and Aunt Chris too, to know you are carrying on the family tradition!! Keep up the good work. It looks good!! Doesn't look very messy to me. I think that is a pretty good attempt for a first timer! And you were smart enough to start small ... I always find great (large) cross stitching projects and inevitably give up about 1/2 way through. GOOD LUCK with your future projects!